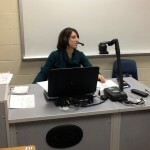 Mrs. Castillo leading her class in a Spanish lesson. 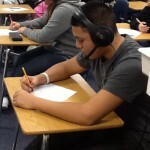 One student collaborating with another on a Spanish video. Another student reinforcing her listening comprehension skills through an activity. The language lab has been a fabulous asset to the LOTE Department this fall! The students and teachers are all enamored by its tremendous capabilities! The students are able to talk to each other in groups or in pairs and the teacher has the ability to listen in and become a part of that conversation at any point! 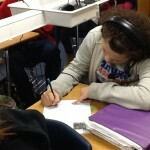 The students can be recorded, and these recordings can be used for both formative and summative assessment. Any curriculum website materials are accessible through the lab, and the on task engagement is amazing! Language learning acquisition is at our fingertips!